Rugby World caught up with the Italian centre about memories, being starstruck, and walking the runway for fashion institution Armani. Just to ease the sibling confusion, a regular occurance he tells us, Mirco is not the one who scored a try against Wales, that would be his brother Mauro. RUGBY WORLD: How did you celebrate the wins over Scotland and Wales? MIRCO BERGAMASCO: Partying. In Edinburgh we had an early flight the next day so a lot of us went straight from the clubs to the airport. In Rome we closed the discos one by one! RW: Who are the practical jokers in the Italy team? Any good pranks? 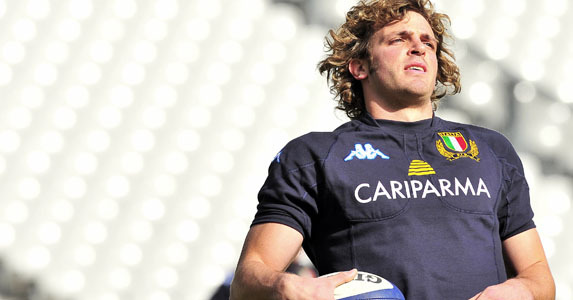 MB: Sergio Parisse, Gonzalo Canale and Martin Castrogiovanni. When in Rome, on Wednesday we roast suckling pig. The three started hiding the pig’s head in unexpected places: your bag, your bed, your shower. Now everyone is at it. RW: What’s the funniest thing you have seen on the pitch? MB: During a French Championship match, a guy ran onto the pitch naked and started shaking hands with all the players. He had written all over himself in felt pen. We returned the handshake even though we’d have preferred a girl. RW: Have you ever been mistaken for anyone else? MB: Many times: people take me for my brother, Mauro. After beating Wales I was complimented no end of times for his try. MB: I don’t really have one, but most of the English-speaking coaches, and I’ve had many in my career, find it difficult to say ‘Mirco’ so they call me ‘Micro’. RW: What’s your philosophy on life? MB: I suppose ‘Never give up’. The early days with Stade Français were rough; things weren’t going well and I thought about packing and leaving, something I’ve never confessed to anybody. Luckily my brother was there to help me and by sticking at things and taking a day at a time I managed to get through. RW: What three things would you save if your house was burning down? MB: Family first. Girlfriend isn’t an issue as I don’t have one. My laptop – it’s got all my photos and film clips on it. Maybe I’d slip my mobile in my pocket as it would be a nightmare to retrace all the numbers. RW: What are your phobias? MB: I hate that claustrophobic feeling when you’re in the tunnel for MRI scans. I try to keep my eyes closed; if I open them it’s a horrible sensation. I wasn’t keen on spiders until someone told me they make you rich. We say: “Ragno porta guadagno.” Spider brings in money. RW: Are you a breasts, bum or legs man? Who’s your ideal woman? MB: I’d go for the bum. I like [actress] Monica Bellucci, she’s very intriguing. MB: X-ray eyes! It sounds a bit perverse but I like seeing what’s hidden. MB: I’m shy and when I’m introduced to people for the first time I often go red. The more people notice, the redder I get. MB: Once someone wrote it was a pity my brother was injured and not me. That is pretty nasty. The best has still to come. RW: Have you got any crazy fans? MB: After seeing the Stade calendar, a girl asked if she could touch my bottom to see if it was as hard as it looked. RW: Have you ever been starstruck? MB: When I went on the catwalk for Armani. There was ex-Bond girl Maria Grazia Cucinotta, George Clooney, Italian actor Raul Bova. I knew who they were, I don’t think they had a clue who I was. Fortunately, there was also Lawrence Dallaglio. At least he remembered me. RW: Win the World Cup or €1.5m? MB: The World Cup. I’m happy enough with what I’ve got and if we won the World Cup there might be some extra euros coming my way anyway.